I hate chickens. Which is really unusual since I love most animals, especially birds. With the exception of just a couple of years, I have had some kind of bird my entire life. But chickens are dirty, nasty creatures that poop on their own eggs. And roosters are mean evil things. This hatred clearly stems from childhood trauma. When I was younger than five, we had free-range chickens, when it wasn’t even cool to have free-range chickens. (Honestly I think my father just couldn’t keep them penned in). Every time I went out the door, a particularly mean rooster flew up into my face and attacked me. My father’s solution? The rooster stick. We kept the stick by the door and I was supposed to defend myself when attacked. You can imagine how that went. For my third grade birthday my parents let me have a sleep-over. I was absolutely thrilled and invited a bunch of my girlfriends to spend the night. Unbeknownst to me, the next day was “cull the herd day”. My father slaughtered some chickens right in our front yard (I am still trying to figure out his thought pattern since my birthday is in February and it must have been cold outside.) Without getting into the gory details – the end result was that NO ONE EVER WANTED TO SLEEP OVER MY HOUSE AGAIN. When I was older, I was assigned many chores. One of these was taking care of the chickens and roosters. I fed them twice a day, collected the eggs and cleaned out the coop. We had a large coop that was really a shed. My father cut a small door into it for chicken exit/entry and added on an outside run. It was large and I had to walk into a roomful of fowl, foully glaring at me twice a day. My father built nesting boxes along one side of the wall. Now, I don’t know where my father got our chickens, probably from Dropped Eggs R Us, but these chickens did not know how to use nesting boxes. They laid eggs everywhere but in the nesting boxes. I had to search the dark recesses of the shed coop (which didn’t have a light) for every shat-upon egg. And let me tell you, nothing looked more like a target for a stray rooster than my arse while I was bent over collecting those eggs. 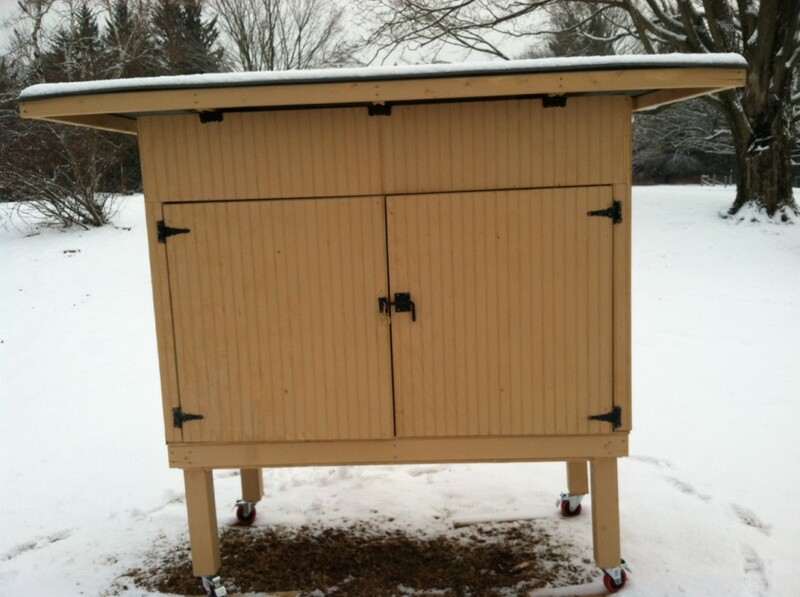 So, one concession my father did make for me was a handy drop down door that kept the chickens outside while I worked in the coop. That was if my trusty rooster stick and I managed to send all of them outside at the same time. 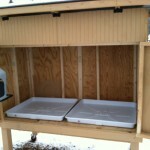 Cleaning the coop was something that I have tried hard to repress. My father probably wasn’t cut out to be a farmer. 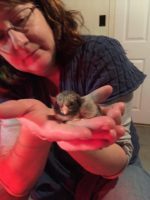 As my mother said, “your father would just drop animals into the barn and then expect you guys to take care of them.” About once a year, mid-summer, my father decided it was time for me to clean the coop. Since I didn’t know any better, I thought that was acceptable. I would spend a day with a kerchief wrapped around my nose and mouth lifting out layer after layer of chicken manure. The smell – I can’t even describe it. 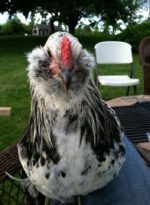 I did it – but I vowed that I would never, ever own chickens. Then we bought our beautiful farm, I acknowledged out loud my love of fresh eggs and thought maybe I could put my past behind me and raise chickens – the right way. But NO ROOSTERS. 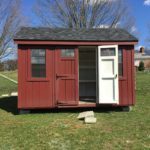 I researched chicken coops and fell in love with chicken tractors – portable coops that can be wheeled around to different parts of your property to allow your chickens to free range. They looked so neat, and organized and clean! So like any good mate, Spouse first looked at me incredulously, hemmed, hawed and swore a bit, then embraced my idea whole-heartedly. And he built me a chicken tractor for Christmas! (but it wasn’t quite done until after Christmas). 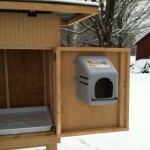 It has removable plastic trays and wide swing-out doors for easy cleaning, new-fangled nesting boxes hung on the doors for easy access and a roof that can be tilted up for ventilation. 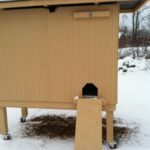 The chickens will leave the coop via their very own chicken-sized ramp that can be easily closed at night to dissuade the many foxes in the area. Once Spouse also builds the outdoor run (hint, hint if you are reading this) we will be ready for chickens in the spring (but no roosters). And maybe I will finally overcome my childhood trauma.